Iron Man 2 might not have been everything Iron Man 1 was, but it had something (at least as far as this viewer was concerned) that its predecessor did not - a great villain. Whiplash, as played by Mickey Rourke, made for a visually, if not grammatically, interesting character. 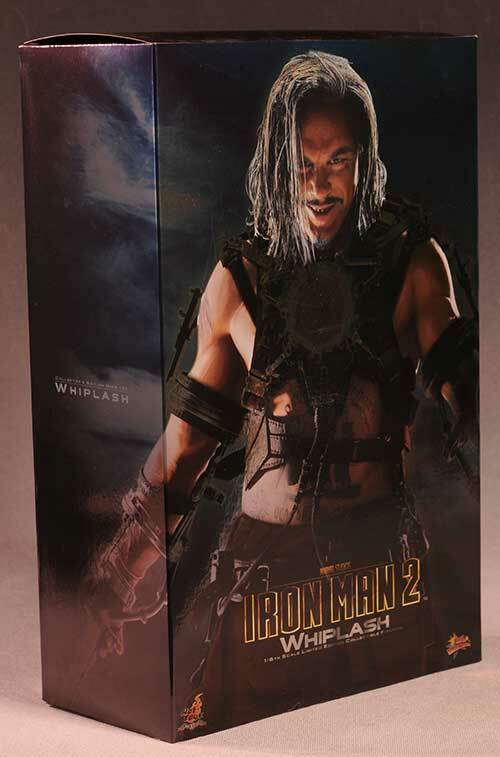 With Hot Toys working the Iron Man movie license for all it's worth, there's no surprise that they've released Whiplash in their sixth scale series. With War Machine, several more versions of Iron Man, and Black Widow all on the way, this license may prove to be THE series for Hot Toys, covering more ground than we've seen with any other series. It seems obvious that they'd pick up the Avengers, Captain America and Thor licenses, giving us a very cool set of movie Marvel figures for the shelf. You can pick up this guy for around $160 or so, depending on the retailer. He just started shipping internationally, so the US distributors won't have them quite yet. Great graphics, completely collector friendly, with a bright, shiny outer sleeve to top things all off. 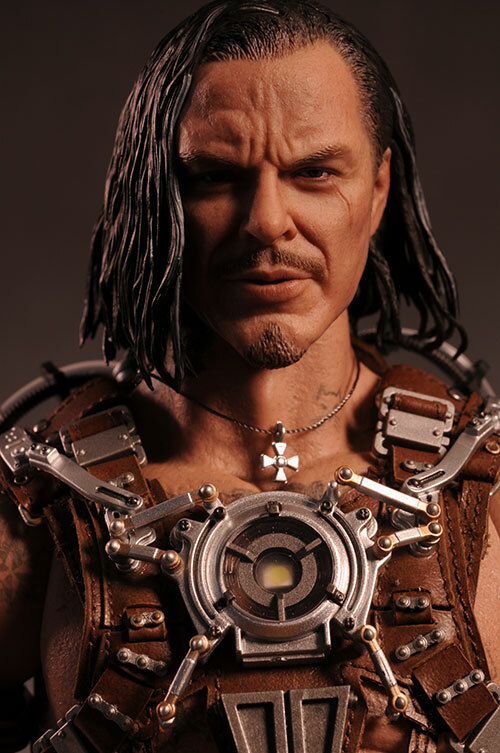 I'm almost always happy with the Hot Toys packaging, but my only complaint this time 'round is the ONE twisty tie holding him in the tray. 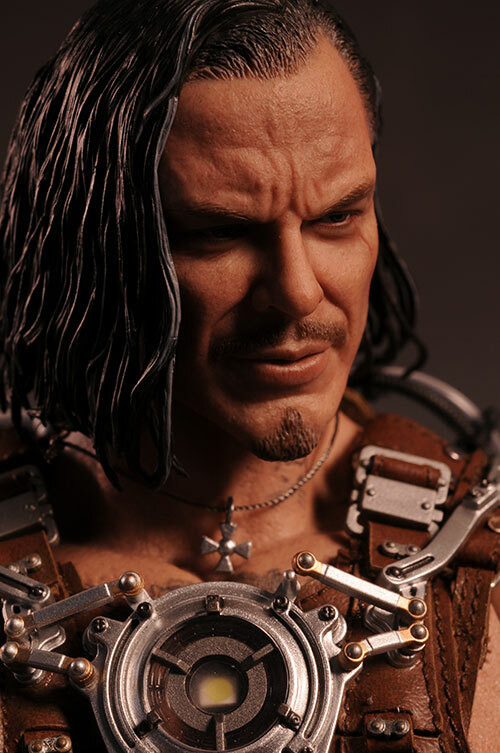 If you're looking for realistic portraits, you won't find anything better than the work being produced by Hot Toys these days. Once again, this small head sculpt looks just like an actual person, shrunk down to sixth scale. However, I'm not sure that this is the best Rourke they could have produced. Part of the problem is that they continue to raise the bar, setting expectations higher and higher even for themselves. It's good, don't get me wrong, but there's something slightly off about the eyes. If I were comparing this to past work, I'd say it falls above the usual Tony Stark work, but below the recent T-800 or Aldo Raine. The sculpted gripping hands work pretty well, or you can go sans whips and stick with the fists. The production paint work is outstanding as always. The hair has a nice mix of gray and black, with a perfect hairline. The eyebrows, mustache and beard really show off the realistic nature of their work, and even the skin tone looks amazing. The figure looks like a real person, even with close up photography. 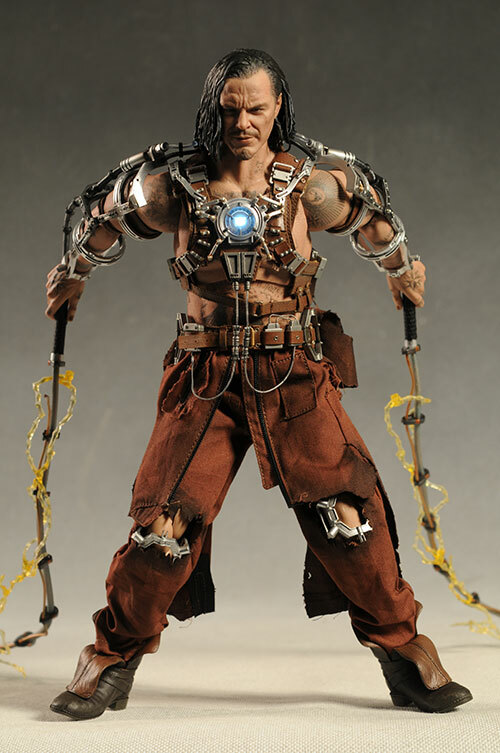 This figure has more paint work than the usual however, because of the many body tattoos that Rourke sported in the film. From the belly to the back to the shoulders to the hands, the tat work is gorgeous. It's even slightly faded in color, as though the ink work is older. It's this sort of attention to detail that continues to set Hot Toys apart. With all that great work on the body, it would be easy to overlook the colors on the various metallic parts of the harness, but don't. They've highlighted the amazing sculpt detail of the mechanics with precision paint work, further adding to the overall realism. Whipster is on the usual TrueType body, muscle version. The upper body is a bit restricted, particularly the elbows, but you have to be willing to sacrifice a little mobility for the cool harness. The neck works well this time around, much better than it did for me on the T-800. It's a similar design, with two joints, one at the top and bottom of the neck. From the waist down, I had some issues that I almost never see with the TrueType - floppy joints. The knees and the ankles are looser than I'm accustomed to with this body, but I was able to get him to stand fine on his own with shallower stances. The hands also pop off quite easily, due to the short wrist pegs and tight fit of the harness at the wrist. It wasn't a huge deal at first, but it does tend to annoy you after awhile. 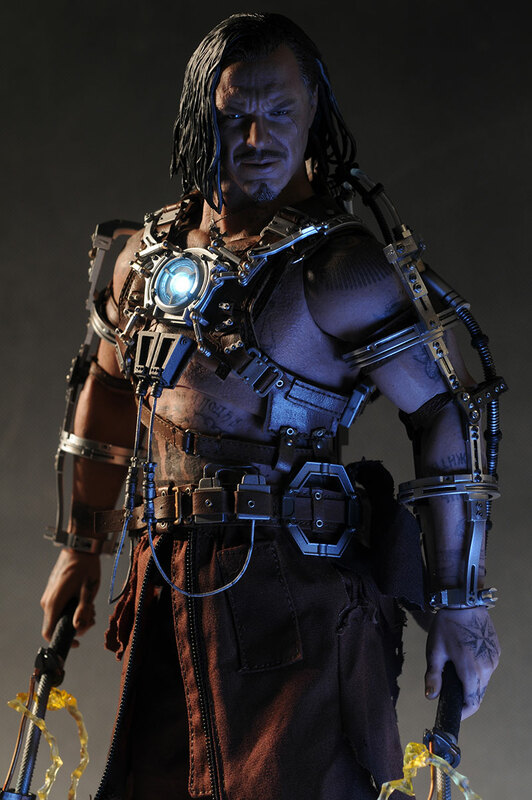 Hot Toys has spoiled us with the level of accessories they've been including with recent releases. Since most of Whiplash's outfit is attached, there's not much extra included. There's the usual display stand of course, and you may end up needing it depending on how well these ankles and knees hold out. There's also an extra set of hands, done up as fists, in case you don't want to display him with the 'whips'. The whips are really two pieces each - a floppy whip, and an electro-spark that wraps around the whip, done up in translucent plastic. The whip can be posed because of a thin metal rod along one side that is both decorative and functional. It takes a bit of effort to get the faux electricity to lay along the whip just right, but after you play with it for awhile you'll get it in a place that looks good. The handles attach to the rest of his gear by way of the two small tubes running in back of his arms. These slip into the handles quite easily, and look great, but the light feature does not extend to the whips. 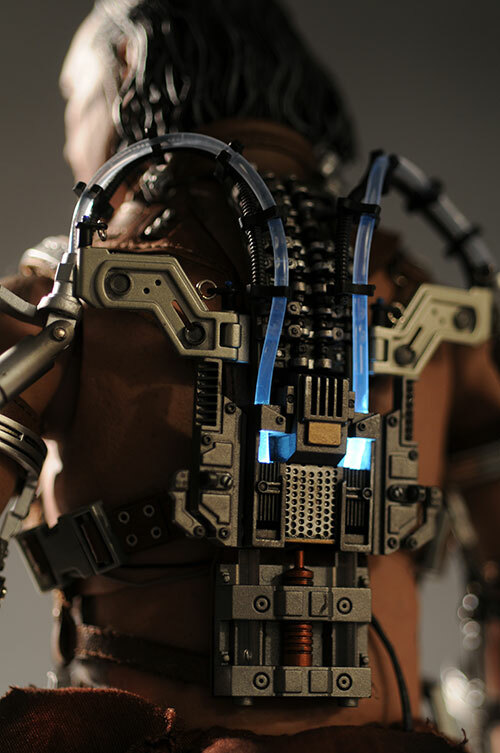 The light up feature is accomplished with a small battery compartment (with switch) that hooks onto his belt in back and is hidden by the burned and torn clothing. You have to pop the battery in, and you'll need a very tiny Phillips screwdriver to open the compartment, but once it's in place, you'll have a strong light at the chest, with slightly weaker light running up the blue rubes in back. It works well, but it's not quite as impressive as some of the previous figures. Here's where this figure really shines. 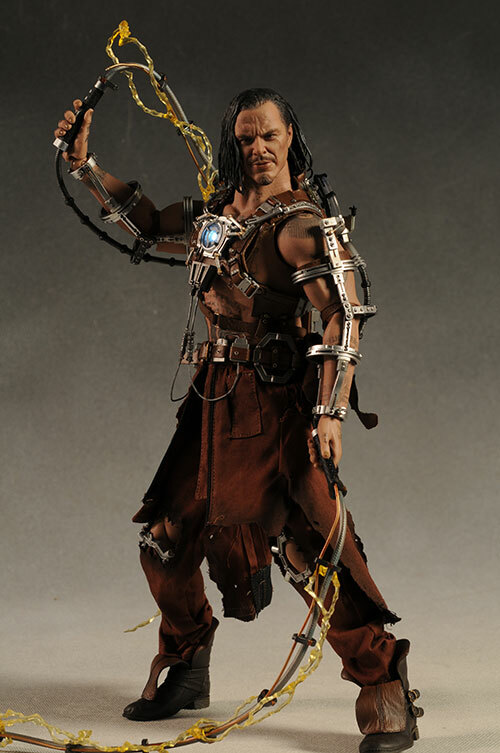 The outfit is fantastic, with an amazing amount of detail in the harness. While I mentioned that the harness restricts the articulation a bit, it still is quite an engineering marvel. The shoulders can take quite a few poses, and even the elbows can bend a bit. Don't over do it, though, as the harness can snap. The harness has flaps that move in back, as well as hoses, wires, buckles, straps, etc. etc. etc. It fits over the torso snugly, and holds its own next to the higher tech Iron Man suits. I do have to admit that I'm not sure what the 'knee pads' are for, but hey - they look cool. The coveralls are burned and torn free of his upper body, with the strips hanging down around his waist. They used one of these strips to hide the battery compartment and switch for the light feature. The lower pants look good, and the boots are sculpted open, with the tongues hanging out. However, they aren't the right color (thanks to readers more observant than I for pointing that out). On screen, they were orange, while here they are brown. Hot Toys has said that this has to do with legal issues - perhaps the Grand Prix folks had something to say about it? While none of the Hot Toys figures could be considered 'toys' (and the irony is not lost on me), these still carry the DNA of their ancestors, the G.I. Joes and other sixth scale figures of the 60's and 70's. For anyone capable of handling the figures with care, there's plenty of potential in posing them and displaying them. Without the additional accessories, it's tough to call these worth more than the usual $150 or so that's the normal Hot Toys rate. Then again, perhaps they are merely making it tough to follow up some of their own recent releases. The screw used to hold the battery compartment closed is VERY tiny. Work on it in a location where dropping it won't mean disaster. While I had a few minor issues with the figure overall, the harness and outfit is simply amazing. With all the Iron Man suits on the shelf, the display can get a smidge...redundant. This figure really stands out, and is our first villain in the line. After messing with it for awhile, my biggest issue ended up being the floppy ankles and knees. Posing him got to be more annoying than fun, and I suspect I'll end up with the sturdiest stance I can find, and sticking with that on the shelf. - has him on pre-order at $162. - has him on pre-order at $165. - also has him on pre-order, but at $170. 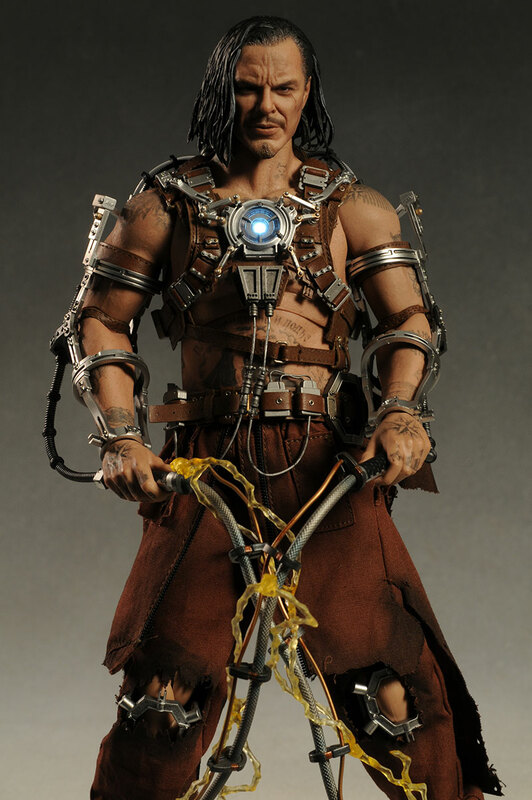 - Sideshow has him for $180. 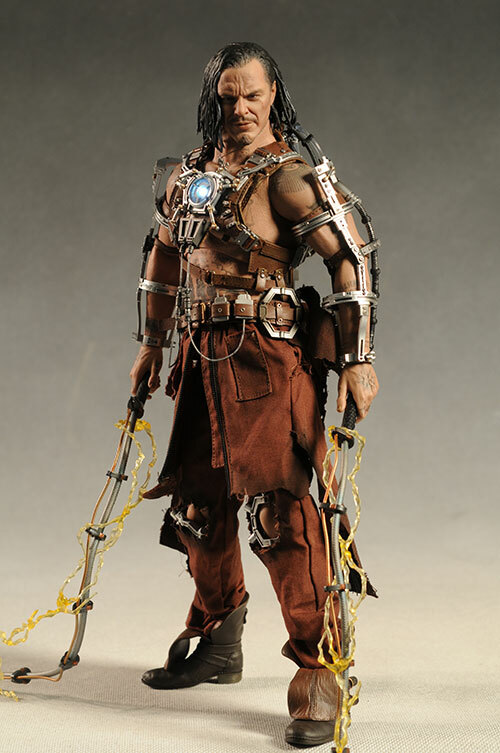 - the last review I did was for the terrific Mark I figure.